Commenting on the recent CNN report that US ships and aircraft have been moved into position and are ready to strike Syria's Shayrat airbase if the Syrian government makes "any further moves toward a chemical weapons attack," Lt. Gen. Evgeny Buzhinsky told Sputnik that the US is simply looking for an excuse to strike the airbase. On Wednesday, CNN reported that Syria's Shayrat airbase "remains under constant overhead surveillance by the US for further signs of whether a chemical strike may be in the works." It followed the claims of the White House that the US allegedly "observed potential preparations for another chemical weapons attack by the Assad regime." White House spokesperson Sean Spicer on Monday threatened President Assad that "he and his military will pay a heavy price" in case Syria's President "conducts another mass murder attack using chemical weapons." 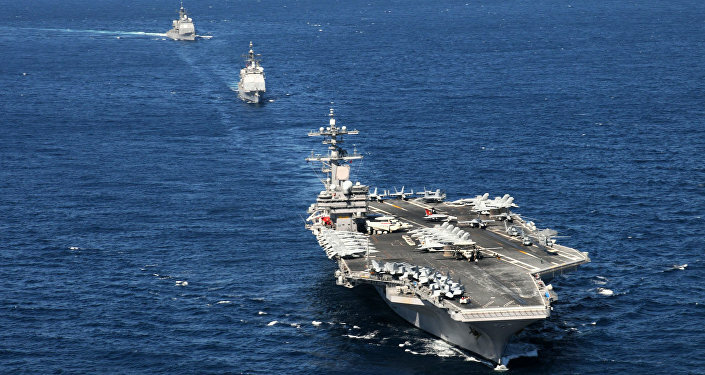 CNN reported that the aircraft carrier USS George H.W. Bush, along with two destroyers and two cruisers have been deployed in the eastern Mediterranean Sea for routine patrol positions. "The destroyers and cruisers could fire Tomahawk missiles without putting pilots in manned aircraft at risk. In addition, dozens of aircraft already in the Middle East for operations against ISIS (Daesh) in Syria and Iraq could be used in a potential strike," the broadcaster said. 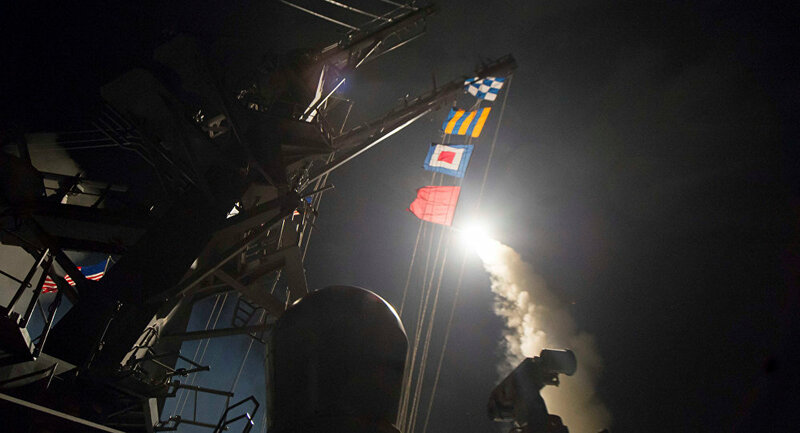 Is the US Really Ready for 'Unprecedented Actions' in Syria? As no chemical attack followed the claims, US high officials offered their explanations. Defense Secretary James Mattis claimed on Wednesday that "he believes Syria has backed down." "It appears that they took the warning seriously," Mattis told reporters during a trip to Brussels for a NATO meeting. "They didn't do it." Nikki Haley, the US ambassador to the UN, also told Congress that "Trump's warning stopped the Assad regime." On Thursday, Russian Foreign Ministry spokeswoman Maria Zakharova commented on the claims. "Unfortunately, Washington has voiced new baseless accusations against the Syrian leadership that [Damascus] allegedly is planning a new chemical attack. We know about these statements, which the Washington officials have refused to support with facts. And we don't know what data was used to make such conclusions," Zakharova said. " Former Russian Defense Ministry senior official Lt. Gen. Evgeny Buzhinsky told Sputnik that the US is looking for an excuse for a new attack. "The Americans are seeking an excuse to be able to demonstrate yet again their determination and gun power. We shouldn’t rule out something happening. In the current climate, we can expect the unexpected from the US, as well as predictable events," he said. The expert referred to the US attack on the Shayrat airbase on April 7 after it blamed President Assad for the chemical attack on Syria's Khan Sheikhoun. On April 4, the National Coalition for Syrian Revolutionary and Opposition Forces claimed that 80 people were killed and 200 injured in a suspected chemical attack in Khan Sheikhoun, blaming the Syrian government. Damascus rejected the accusations and said that the militants and their allies were responsible. Maria Zakharova also referred to the incident during her weekly press briefing on Thursday. She reminded reporters how, following the Khan Sheikhoun incident, a massive information campaign was launched in mainstream media to put the blame on the sovereign leader of Syria. She said that the latest claim made by the White House would likely trigger a similar campaign. "Pictures of dead children will emerge in social media," Zakharova said, also recalling the involvement of the so-called White Helmets, or the Syria Civil Defense in developing the narrative then used by the mainstream media in the US and Europe. She added that all kinds of substances like laundry detergent were used to "prove" that there were chemical weapons in Khan Sheikhoun, since there has been no credible investigation of the events in Idlib province. The spokeswoman however said that on Wednesday, Russian Foreign Minister Sergei Lavrov pointed out that almost three months since the alleged attack, Russia is still trying to push for an OPCW (Organization for the Prohibition of the Chemical Weapons) mission to be sent to the site.